25 May 1881: After a long dispute, Hamburg signs the treaty with the German Empire regarding its duty-free trading, but keeps its customs authority status and the right to establish a free port. In these enclaves, Hamburg merchants retain their privilege to store and process imported goods without paying duty. 1883: The Kehrwieder and Wandrahm quarters to the south of the city centre and financial district are chosen for the construction of the Speicherstadt warehouse district. Starting in 1883, the Kehrwieder and Wandrahm quarters are cleared of around 1,000 houses and over 20,000 inhabitants for the construction of the warehouse blocks. The city relocates those affected, often without compensation, and the creation of new housing is left to the free market. 1888: On 15 October 1888, Hamburg implements its customs-free zone and Kaiser Wilhelm II arrives to perform a formal ceremony on 29 October. The ceremony takes place on the Brooksbrücke bridge, where the first part of the Speicherstadt and the new free port are inaugurated. 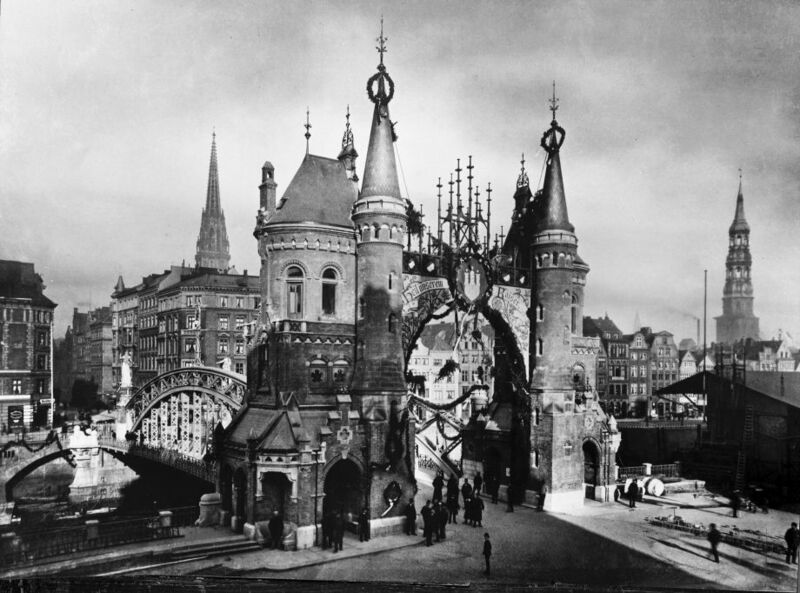 1885–1927: The construction of the Speicherstadt is split into three phases between 1885 and 1927. By 1889, 60 percent of the warehouse spaces (blocks A to O) have been completed between Kehrwiederspitze and Kannengiesserort. Warehouse blocks P, Q and R on St. Annenufer and Neuer Wandrahm are built in the second construction phase from 1891 to 1897 and in the third construction phase from 1899 to 1927, which is interrupted by World War I and the years of inflation that follow; the area to the east of the Bei St. Annen street is completed (blocks S to X). The original plan is for a fourth construction phase (blocks Y and Z), which is to be built on the Ericusspitze starting in 1905, but this is never realised. 1927: 24 warehouse units with around 300,000 square metres of warehouse space are completed .The warehouses are used for the duty-free storage of goods, which can be transported by road and via the canals. The warehouse lofts are primarily used for storing colonial goods such as tea, coffee and spices, where they are also refined and repackaged. The ground floor is largely used as office space by warehousing and trading companies. 1943/44: During World War II over 50 percent of the Speicherstadt is destroyed, in particular during the summer air raids of 1943/44. Subsequent reconstruction initially concentrates on the quay facilities so as to ensure that goods are handled, warehouses are only being repaired at a later stage. 1946–1967: Warehouse blocks A, B, C, J, K, and M, as well as the eastern section of block O, have been almost wholly gutted or destroyed. Blocks A, B, C and J are not rebuilt. The Hanseatic Trade Center now stands where these formerly did. Under architect Werner Kallmorgen and HHLA’s building supervision, however, the bulk of the warehouses are preserved and restored. During reconstruction, the existing timber foundation piles are re-used throughout. 1952/53: Rising conspicuously among the new office blocks are the Freihafenamt at Bei St. Annen 2 (1952/53), and block T on Alter Wandrahm (1967). Their strictly geometrical red-brick façades are characteristic of Werner Kallmorgen’s efforts to revive the Hamburg building tradition using modern methods and materials. 1960: Until the introduction of the container in the 1950s and the restructuring of Hamburg’s port attributable to this, quartermasters and ship’s chandlers characterise the scene in the Speicherstadt. Elaborate warehousing of goods is nevertheless costly and not profitable for bulk goods. Many traditional merchants give up or relocate their companies. 1980: A substantial structural transformation occurs in the Speicherstadt at the beginning of the 1980s. The onward march of the container revolutionises the port and storage logistics, while conventional general cargo handling surrenders its importance. Waterfront barge/lighter traffic has been declining continuously since the 1960s and now collapses entirely. Goods traditionally stored in warehouses, such as coffee and cocoa, are now increasingly transported loose in containers. 1980s: The Speicherstadt develops into the world’s largest storage and trading centre for oriental carpets. Using winch technology, carpet traders operate in a similar manner to traditional merchants when loading and unloading their wares onto/from lorries on the roadside. 1988: The Hamburg Senate adopts a scheme for privatising the Speicherstadt. After a protest based on the motto “Hands off the Speicherstadt”, initiated by quartermasters and supported by the public, the Senate drops the proposal. 1991: At Kehrwiederspitze, 3.3 hectares are removed from the port area and privatised. The remaining area of the Speicherstadt is listed for protection as a historic monument. 1997: Hamburg’s First Mayor Henning Voscherau presents the HafenCity Hamburg project drawn up by architect Volkwin Marg and Peter Dietrich, then chairman of the HHLA executive board, to an astonished public. 1999: The permanent exhibition Hamburg Dungeon is opened as the Speicherstadt’s first touristic venue. Shortly afterwards, the Dialog im Dunkeln exhibition (2000) and the Miniatur Wunderland model railway exhibition (2002) open their gates to the public. Today, the Miniatur Wunderland is Hamburg’s most popular museum (1.1 million visitors in 2014). 2001: HHLA opts for a strategy of speedier, yet cautious, structural change in the Speicherstadt. 2002: Under the baton of renowned architects gmp, the “town hall” of the Speicherstadt, which serves as the head office of HHLA, undergoes comprehensive renovation and reconstruction. 2003: From midnight on 1 January, the Speicherstadt is relieved of its free port status. Since then, HHLA has been developing and implementing modern utilisation concepts for the warehouse blocks and Kontorhaus buildings. Agencies, publishing houses and other service providers are the first to move into the new facilities. 2007: HHLA’s Speicherstadt properties along with Fischmarkt Hamburg-Altona GmbH become a separate HHLA Group company. Its shares are not traded on the stock exchange and remain 100 percent held by the City of Hamburg. 2008: Textile wholesalers move into the Speicherstadt, swiftly followed by large showrooms. With almost 30,000 square metres, the fashion industry is now one of the biggest user groups of the historic storage lofts. 2008: The International Maritime Museum moves into the premises of Kaispeicher B. 2012: The Speicherstadt is no longer part of the port. The Hamburg Parliament shifts the boundaries of the port on 13 September and adopts a development scheme for the Speicherstadt. 2014: The Speicherstadt’s first hotel opens its gates. To facilitate the new hotel, the former Kontorhaus building at the Sandtorkai and the Hamburg Coffee Exchange are redeveloped.